Allex Muller, Maverick Schmit and Valentin Ringlet's engineering project "A Modular Construction 3D Printer" came second in Taiwan International Science Fair's engineering category. Running from 24 January to 2 February, this year saw the 17th edition of TISF (Taiwan International Science Fair). All in all 23 countries took part, and this was the first time that Luxembourg was one of them - thanks to support offered by Fondation Jeunes Scientifiques Luxembourg and their sponsor Paul Wurth S.A. Representing Luxembourg in the engineering category were Alex Muller, Maverick Schmit and Valentin Ringlet and their modular 3D printer - which you may remember from our earlier article on the young scientists. In short, their project is a 3D printer which can be used to print objects out of concrete, which is aimed at improving the construction industry by facilitating the printing of entire buildings and thus reducing overall costs. The team has been working on their printer for over five years, while also researching materials to optimise their results. 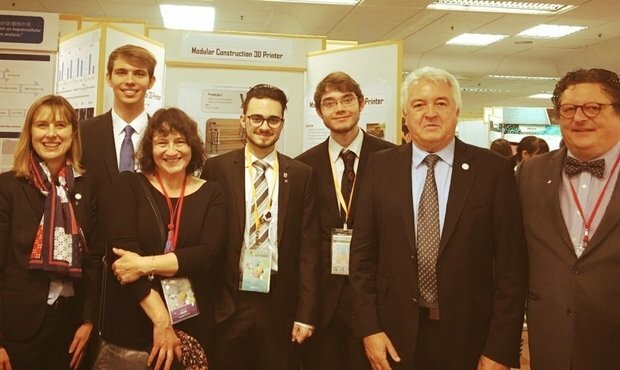 The team also represented Luxembourg at the MOSTRATEC contest in Brazil, where they left a strong impression and were awarded the mention of "outstanding project."